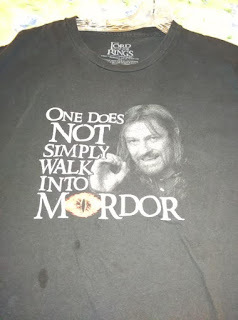 "One does not just simply walk into Mordor" reads a T-shirt I have had for several years now, but one can reach "Mordor" cinematically and with the reader's imagination. My first meeting with J.R.R. 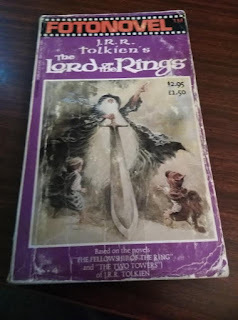 Tolkien's monumental fantasy was in 1964 when I purchased the first of the trilogy in the infamous "ACE Paperback" release, but format aside I was caught. This is not an in depth look at the work, or the two filmed versions but a fans perspective of each. 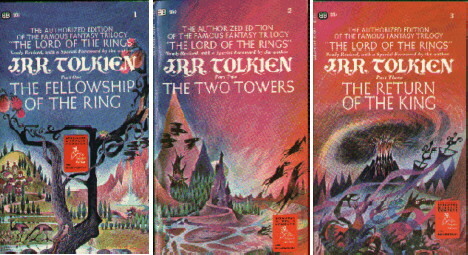 Above are the covers of the first mass marketed paperback editions of the "Lord of the Rings Trilogy" released by any country from ACE Books in the United States. 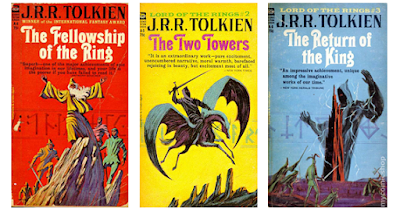 Those three paperback books had a major impact on what the fantasy world of J.R.R. Tolkien's "Middle Earth" would look like after their publication, It also created a minor war between ACE's Donald A. Wolheim the founder of the company and Tolkien. However, let us return to the events between 1950 and 1954 for a perspective on the publishing of Tolkien's epic fantasy. George Allen and Unwin were the publishing firm J.R.R. Tolkien used and originally they were to publish "The Lord of the Rings" in 1950, but three problems arose. The first problem was the length of the work. It was considered too long for an individual published book at the time for the normal British fiction reader. Most such works were divided into multiple releases, but J.R.R. Tolkien refused the suggestion. The second problem presented to the publisher was that Tolkien wanted "The Silmarillion" released with it, but it was still being revised by the author. The third problem which also went to the length of the overall work was the paper shortage in the United Kingdom from World War 2. As a result of this perceived lack of co-operation by George Allen and Unwin by the author. J.R.R. Tolkien took up an offer from Milton Waldman of rival publishing house Collins with the stipulation that both works would be published by 1952. The Collins deal fell through also over the length of the work. That publisher wanted to edit "The Lord of the Rings" to a more suitable version and Tolkien returned to George Allen and Unwin. His reliable publisher convinced the author that the work should be divided into three parts and "The Silmarillion" be released when it was ready for publication. Once again it was the overall length versus the paper shortage in the United Kingdom. Another factor used to convince the author to divide the work were his royalties. The publisher's representative explained the probability of a higher amount for the overall work. As potential readers of the second and third installments would have to purchase them separately once they came out. After some back and forth debate over the titles of the three installments an agreement was reached. Tolkien originally thought the title "The Return of the King" gave away some of the plot and "The Two Towers" was confusing. As there were three related sets of "Two Towers" mentioned in his work depending on the events. The groupings were Orthanic and Barad-dur, Minas Tirith and Barad-dur, or Orthanic and Cirith Ungol. On July 24, 1954 "The Fellowship of the Ring" was published in the United Kingdom. In October of 1954 American publisher Houghton Mifflin first published that work in the United States. Which brings me back to ACE Books. So who was Donald A, Wolheim besides a fan of "LOTR"? To start he was an avid fan of science fiction. On October 22, 1936 22 year old Donald A. Wolheim created the first Science Fiction Convention. This occurred when he led a group from New York City to Philadelphia to meet with a local group from that city. "Philcon" still holds yearly conventions. Wolheim founded the "Fantasy Amateur Press Association" in 1937. Members would include Forrest J. Ackerman, Robert Boch and other writers, editors and publishers of Fantasy, The group finally disappeared during the late 1990's. Also during 1937 Wolheim created what is considered the best known of Science Fiction Clubs "The Futurians". The group included authors, editors and publishers such as Isaac Asimov, One of the initial members of both groups in 1937 was Virginia Kidd age 16. Kidd would become a freelance writer of science fiction, ghost writer, proof reader, editor and feminist. Donald A. Wolheim stated writing his own science fiction stories at age 19 and worked his way into editing science fiction magazines. In 1943 he was the editor for the first mass marketed Science Fiction Anthology "The Pocket Book of Science Fiction". It was also the first book whose title contained the two words "Science Fiction" in it. Four years later in 1947 Wolheim would work for Avon Books as an editor of their science fiction works. In 1952 he left Avon for the Ace Magazine Company to create their Ace Books spin off. In 1953 he introduced science fiction to the company. Eventually Wolheim became Editor-and-Chief of Ace Books which would last for the next 20 years. One of his accomplishments was to bring back the out of print Edgar Rice Burroughs' "Tarzan of the Apes" series. It's success led to the first paperback editions of both the "John Carter of Mars" and "Pellucidar" stories. Wolheim's Ace Books also became the first publisher of a paperback edition of Frank Herbert's "Dune"..
Then there was J.R.R. Tolkien's the "Lord of the Rings". Shortly after the George Allen and Unwin publication of the Trilogy. The American Publishing house Houghton Mifflin published Tolkien's work for the first time in this country by importing sheets made by the British publishing firm. Donald A. Wolheim wanted to publish the trilogy in paperback and Ace Books looked into the possibility. What Wolheim discovered was that Houghton Mifflin forgot to copyright the work in this country and that became the "Loophole" he used.. Legally "The Lord of the Rings" appeared to be in public domain. In 1964 the first of the three books "The Fellowship of the Ring" was released. Shortly to be followed by "The Two Towers" and "The Return of the King". J.R.R. Tolkien had not authorized this edition, nor was he receiving royalties from Ace Books. Tolkien took to the newspaper media of the time and fan magazines. He wrote letters to the fans of his work attacking Ace Books. It worked. Woldheim was forced by the publicity and backlash to pay Tolkien a small amount of money, but nowhere near what his royalties should have been. He also removed the paperbacks from sale. J.R.R. 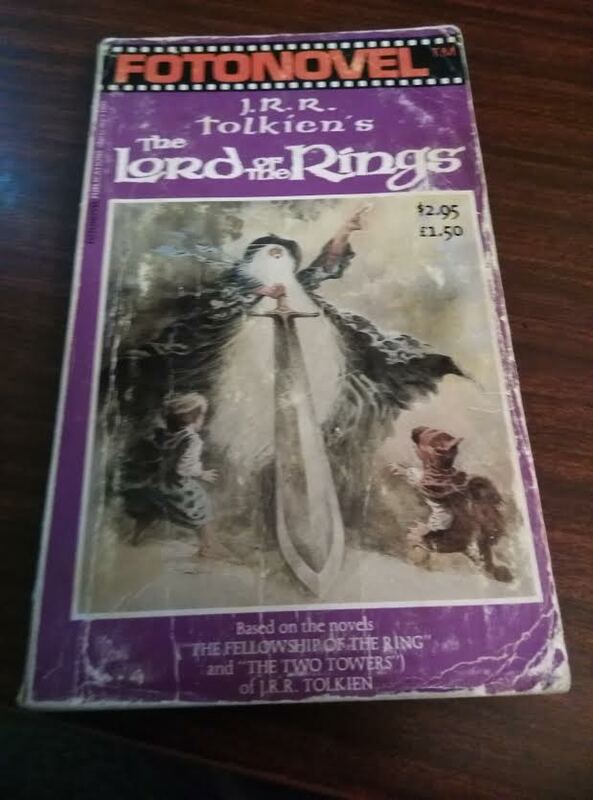 Tolkien than proceeded to revise "The Lord of the Rings" into what became known as "The Second Edition" as a means of further attacking the Ace Paperback Editions. 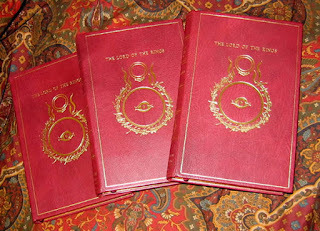 One unintentional result of this act was to turn the three Ace Books into sought after collectibles. As of this writing each individual part of the trilogy depending upon its condition sells between 30 and 140 dollars. An example of the changes that J.R.R. Tolkien made to "The Lord of the Rings" was with his character of Smeagol aka: Gollum. Tolkien not only revised him in the work in question, but changed the character as written in "The Hobbit" to fit the longer work's description. In a 1993 Court Case it was found that the "loophole" used by Wolheim to publish Tolkien's work was illegal under International Copyright Laws. The problem here was at the time of the Ace Book publication the United States had yet to join the "International Copyright Convention". Houghton Mifflin was also found in violation of existing U.S. Copyright Laws by not declaring they had imported the sheets of the "Lord of the Rings" made by George Allen and Unwin. It should also be noted that in 1961 J.R.R. Tolkien had authorized a paperback edition of "The Hobbit" in the U.K. only. In 1965 Tolkien authorized Ballatine Books to publish a paperback edition of the "Second Edition" in the United States. This publication is credited with moving the company to the front of that industry as Donald A. Wolheim's daughter implies in the above quote. RALPH BAKSHI'S "THE LORD OF THE RINGS"
Right now let me get this over with. 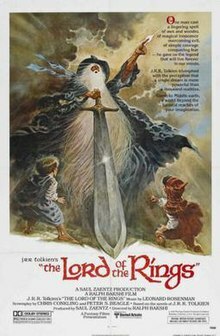 I prefer Ralph Bakshi's "The Lord of the Rings" to Peter Jackson's trilogy. Perhaps its the frantic pace, or the switch between rotoscoping and cell animation that ads a certain texture to the film. As compared to live action and CGI. Not to say I do not completely dislike what Peter Jackson did. That said the year was 1957. One of the assembly line animators for Paul Terry's "Terrytoons", located in New Rochelle, New York, had discovered J.R.R. Tolkien's "The Lord of the Rings". He set out to try and convince Terry to obtain the rights and make it into an animated feature. It didn't work, but that 19 year old animator, Ralph Bakshi, would keep his dream alive. Bakshi would eventually have his own studio and create some very adult, for the time, features including "Fritz the Cat" rated, at the time, "X". Followed by "Heavy Traffic", "Coonskin" and "Hey Good Lookin"" originally made between 1973 and 1975, but shelved until 1982. I recommend all of these to serious students of animation. Which brings me to 1976 and Ralph Bakshi's fantasy allegory "Wizards". The original title of the 20th Century Fox film was to have been "War Wizards", but Bakshi agreed to drop the word "War" for George Lucas. Lucas was afraid the title "War Wizards" might confuse his potential audience for a film he was shooting called "Star Wars". The agreement also called for Mark Hamill to take time off from "Star Wars" and record a voice, Sean King of the Mountain Fairies, for Bakshi in his film. "Wizards" is a must see animated film for any of my readers unfamiliar with it. It tells of a peaceful future world where fairies and humans coexist. The viewer discovers this is the Earth after a great atomic war. The peacefulness disappears with the discovery of an ancient movie projector and films of Hitler and Nazi Germany. "Wizards" becomes a cautionary tale of good vs supreme evil as a good Wizard fights an Evil Wizard. The story sounds like shades of "The Lord of the Rings" Ralph Bakshi had wanted to make. The similarities continued as the images below show. The animator was forced to use rotoscoping, because 20th Century Fox Executives would not authorized a budget increase. At the same meeting George Lucas had asked for an increase in the budget for "Star Wars" and was turned down. History would prove the extra investments would have paid off for the Studio. Below the evil sorcerer of "Wizards". 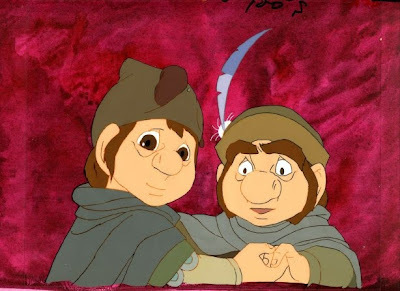 Who has a similar look to his counterpart in Bakshi's "Lord of the Rings". Below Saruman of "The Lord of the Rings". After the release of "Wizards" the time seemed right for Ralph Bakshi to push his dream trilogy. In 1969 United Artists had acquired the screen rights to J.R.R. Tolkien's work.The first screen adaption was attempted by Stanley Kubrick, but that fell through. The studio than hired John Boorman to make the film. Boorman wanted to make the entire work as one motion picture. It also fell through as Bakshi would describe. In a January 31, 2003 interview he told Tasha Robinson about being approached by United Artists. Then the bean counters got into the mix and what was to have been three separate films, became two. Released on November 15, 1978 the 133 minute long "First Part" had a budget of $4 million dollars and grossed $30,5 million dollars. 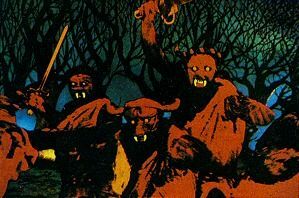 Ir was a financial success, but United Artists had argued that if the motion picture was titled as Ralph Bakshi wanted "The Lord of the Rings: Part One". Nobody would come, because they would know the story wasn't complete. So United Artists released the work as "The Lord of the Rings" giving the false impression that it covered the complete trilogy. United Artists was right, but for the wrong reason. The fans, like myself, felt we had been cheated as the title had implied the complete story and there was a reverse backlash affecting the possibility of "Part Two" being made. I told them (United Artists) they can't drop the Part One, because people are going to come in thinking they'll see the whole film, and it's not there. We had a huge fight, and they released it as Lord of the Rings. So when it came to the end, people were stunned in the theater, even worse than I ever realized they would be, because they were expecting to see the whole film. People keep telling me I never finished the film. And I keep saying, 'That's right! 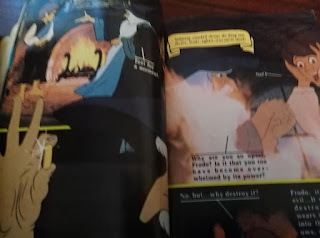 A large portion of "Part One" was shot with live actors in Spain and Bakshi once again used rotoscoping to animate those sequences into the overall production. This was, as with "Wizards", a means of saving money, but it also gave the film a surrealistic look. Especially when the rotoscoping doesn't completely cover the actors real faces. Below a scene is set up for rotoscoping with Ralph Bakshi sitting in the foreground. 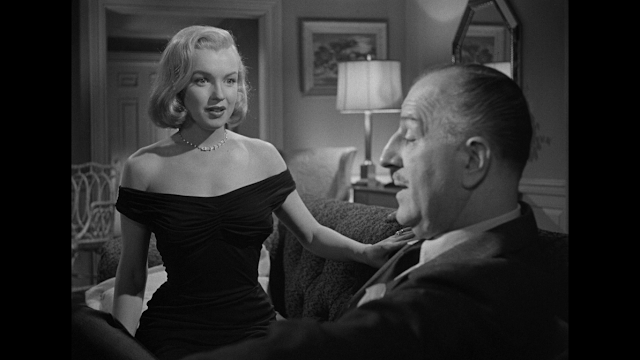 It is followed by a still from the movie showing how the character looked on film. it is the traditional method of rotoscoping but the approach is untraditional. It's a rotoscope realism unlike anything that's been seen. It really is a unique thing for animation. The number of characters moving in a scene is staggering. In THE LORD OF THE RINGS, you have hundreds of people in the scene. We have cels with a thousand people on them. It was so complex sometimes we'd only get one cel a week from an artist. It turned out that the simple shots were the ones that only had four people in them. The following are some of the straight animated scenes from this remarkable motion picture. Accompanying this release was a photo story book which also mentioned that there was to be a "Part Two" to complete J.R.R. Tolkien's fantasy epic. 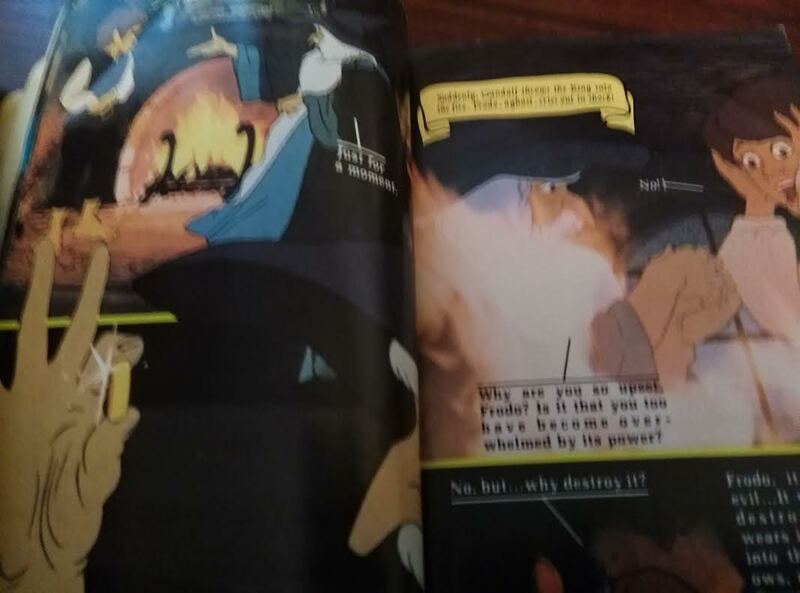 The following two photos are of my copy. 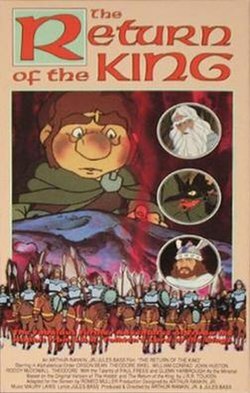 So when Arthur Rankin, Jr. and Jules Bass stated, two years after Ralph Bakshi's motion picture, they would make "The Return of the King' and Warner Brothers stated it was the finish to Ralph Bakshi's "Lord of the Rings". There was high hopes for the quality of the production, but Rankin/Bass let us all down as did Warner Brothers publicity department. Looking at the above stills from "The Hobbit" and comparing them with "The Return of the King". You can see the lower quality of the art work. Additionally if you are unfamiliar with the trilogy and see this film by itself. You will be somewhat lost. It would be 21 year later, before another version of J.R.R. Tolkien's epic fantasy would be seen on the motion picture screen. PETER JACKSON'S " THE LORD OF THE RINGS"
Peter Jackson began making a name for himself with two "Splatter" movies he made in his home country of New Zealand. One "Bad Taste" was a comedy about Aliens who come to Earth to turn humans into food. This was followed by a Musical Black Horror Comedy with Muppet style puppets entitled "Meet the Feebies". The film that finally got Hollywood's attention was "Heavenly Creatures" in 1994. It was based upon a 1950's murder case in Christchurch, New Zealand. Two teenage girls become friends and later murder the mother of one of the two. The motion picture was nominated for a Best Screenplay Academy Award. These pictures lead to Peter Jackson coming to Hollywood and filming "The Frighteners" starring Michael J. Fox in 1996. The movie was a critical and financial failure. The budget was $26 million dollars and the picture made $29.3 million dollars. However, the director had become known for his innovations. In 1997, Jackson attempted to convince Universal Studios to let him film a remake of "King Kong". They turned the film maker down saying with the Walt Disney remake of "Mighty Joe Young" and Tri-Star's "Godzilla" both scheduled for 1998 release the timing was wrong. Jackson next approached producer Saul Zaentz who owned the film rights to J.R.R. Tolkien's "The Lord of the Rings". Zaentz and Jackson came to an agreement and by mid-1997 Peter Jackson had the rights to film the fantasy. Design work started in August of 1997 and Jackson hired his long time collaborator Richard Taylor to lead the now named WETA Workshop in designing the props and prosthetic's for the characters. For the look of "Middle Earth" the director/producer was able to hire both Alan Lee and John Howe, Both illustrators were recognized for their drawings and painting of images from "The Lord of the Rings" trilogy. Jackson initially had a deal with Miramax for a two part adaptation of Tokien's epic, but that fell through when the company started to complain about the money so far spent versus the expanding budget. As a result Miramax was out and New Line Cinema came on board. New Line wanted a three picture trilogy and although Peter Jackson had preferred the two movie concept. He realized that he could now make each part of J.R.R. Tolkien's work as a separate motion picture. Filming began on October 11, 1999 in New Zealand. As many know the last day on initial filming ended 438 days later on December 22, 2000. As to that expanding budget the final cost for the trilogy was $281 million dollars, but the World Wide Box Office would be $2.197 billion, with a "B" as they say, dollars. Of interest is that pick up shoots of scenes continued annually from 2001 into 2004 after the last part of the trilogy was released. Indication that Peter Jackson was thinking of a Director's Cut, or at the least a longer version of the three motion pictures. Ray Harryhausen meets David Lean. Although I get the epic reference to David Lean. Who directed "Lawrence of Arabia" and "Dr. Zhivago", but the reference to Stop Motion Animator Ray Harryhausen I disagree with. The Special Effects work in the film was mainly Computer-generated Imagery (CGI). Whereas Stop Motion is a form of animation closer to Ralph Bakshi's version and definitely the "Terrytoons" he worked upon. There is no question that CGI has vastly improved from 1984's "The Last Starfighter" to the release of Peter Jackson's trilogy. However, the problem I have with the technology that is CGI is the technology that is High Definition for Blu-Ray diskettes, televisions and now 4K television sets. The two are not keeping up with each other. For example when I viewed Peter Jackson's trilogy in the movie theater. I truly enjoyed the adventure and experience. My views of the changes he made aside, but then there was Blu-Ray on my 1080 P television set. Suddenly I could see the details in the non-completely drawn CGI characters in the crowd sequences as compared to those closer up. Obviously even computer generated imagery have a budget point. However, in comparison to Ralph Baskshi's motion picture that used live actors in rotoscoping. All high definition does is sharpen the imagery without changing what were are seeing.. There is no doubt that Peter Jackson's trilogy is full of spectacle, drama and those special effects, but how does it compare to J.R.R. Tolkien's originals? I personally fit in the middle. I like the idea, for example, of what Peter Jackson did by taking part of the opening to Tolkein's "Two Towers" to make the end of his "Fellowship of the Ring" cinematically work as a cliff hanger. Jackson cut out portions of the overall written work allegedly to fit the time limits put on him by New Line Cinema, but then Peter Jackson added into the screenplays portions of the stories from the Appendix for the entire "Lord of the Rings". Which meant he had to cut more of the original trilogy to fit New Line Cinema's requested maximum film lengths for each part of the trilogy. This restructuring of the original story caused fans and critics to debate the pros and cons of using that extra material. From a purely cinematic point of view some of that works. As with the love story between Arwen and Aragorn. Peter Jackson created an interesting unexpected result with some viewers of his filmed trilogy. They accept Peter Jackson's motion picture version of "The Lord of the Rings" as the actual story. These viewers argue in favor of it over the written work. Yet, these same viewers have never opened a copy of the written work and probably never will. While we do have viewers of the filmed trilogy who purchased the written trilogy for the first time, Along with those who have read the original work and viewed the motion picture and debate the two. As I have written above as purists. I am not a purist by any means and using that extra material has, as I have said above, its pros and cons. However, adding source material from another source can in my view be a major problem. This article is not about J.R.R. Tolkien's "The Hobbit", but as that work and "The Lord of the Rings" became tied closer together by Peter Jackson. I must address his filmed trilogy of "The Hobbit". Should you want to see a filmed version of the actual "The Hobbit" as written by J.R.R. Tolkien. My reader should view the Rankin/Bass animated motion picture. The written "The Hobbit" has 289 pages of text. While the written "Lord of the Rings" trilogy, without the Appendixes, in comparison is 1,069 pages in length. 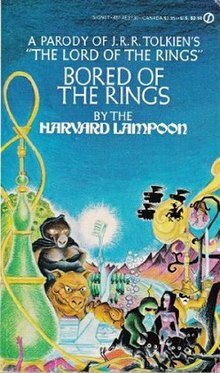 So turning "The Lord of the Rings" even without using the extra material into a motion picture trilogy makes sense. However, turning the written "The Hobbit" into a motion picture trilogy makes no sense. It's just too short, but New Line Cinema requested another money making trilogy from Jackson. Who originally wanted either one film, or perhaps two depending on the available materials. Again Peter Jackson was thinking of expanding the original novel. As a result of New Line Cinema's desire for three motion pictures. Jackson looked at other sources of material written by both J.R.R. Tokien and his son Christopher to create a new story for "The Hobbit". The three screenplays became a direct prequel to Peter Jackson's version of "The Lord of the Rings". He added characters never written in the simple original children's story, These character are only found in "The Lord of the Rings". J.R.R. Tolkien's original written work "The Hobbit" was buried by the producer/director. The final result was a 474 minute theatrical trilogy as compared to the Rankin/Bass 77 minutes animated picture. That running time made Peter Jackson's "The Hobbit" only 84 minutes shorter than his theatrical release of "The Lord of the Rings". Begging the debate that still goes on over Jackson's "The Hobbit" versus J.R.R. Tokien's "The Hobbit". 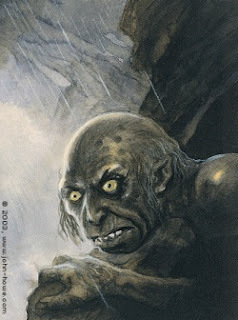 I think Smeagol after he becomes Gollum is one of the most interesting characters created by J.R.R. Tolkien originally for "The Hobbit". The following set of pictures illustrates how he was viewed over the years. 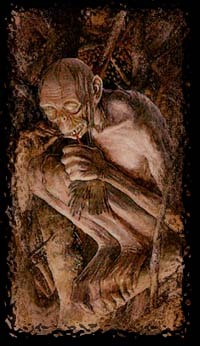 This is one of the first illustrations of Gollum. Below is Gollum by artist John Howe for some editions of "The Hobbit" and "The Lord of the Rings"
Artist Alan Lee drew this Gollum below for the 1997 edition of "The Hobbit". You can see by Howe's and Lee's drawings of this one character. Why Peter Jackson brought them on board as conceptual artists for his "Lord of the Rings" trilogy. Below is Gollum in the Rankin/Bass "The Hobbit"
Gollum as visualized by Ralph Bakshi for his "The Lord of the Rings"
Gollum based upon Alan Lee's drawings from Peter Jackson's "The Lord of the Rings". The first CGI version. THERE CAN ONLY BE ONE LORD OF THE RINGS. So I leave that decision to my reader.